Some people like, some don't. Now let's discuss it, I have seen 607 in real, the train I was on started in NFS then I boarded in St. Catharines heading to the CNE the trip was normal until we reached the Willowbrook Yard and TMC and I saw a BBD 2000 series Bi-Level with it's doors partly painted In the new scheme. 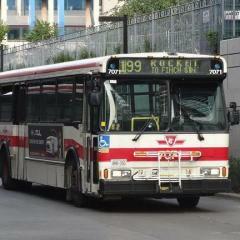 Then we reached Mimico to our delight 607 pulls up with a wired consist. 607, Cab, Bi, Bi, Bi, WC, Bi, Bi, Bi, Cab. That was caught on video, to me I like the new paint but, digitally it looks bad. Oh and BTW I got off at Exibition and saw the 607 from the platform. Two years ago, the bridge across the 16-mile creek in Oakville has been widened to accommodate a third rail track. Why was the bridge not widened by an additional meter to allow for a footpath across the bridge? The additional costs would not have been very high. Currently, several new high-rise buildings are going up on the east side of the creek. For the people in those buildings, it would have shortened the distance to the train station (West of the creek) considerably if such a foot bridge would be available. Unfortunately, they will now have to walk down the hill to the creek and up again other other side to the station. Regrettably, a lot of people will instead use their car (either to the station or all the way to Toronto). Does the reason for the missed opportunity lie in the failure of coordination between the various decision-making authorities (VIA, CP or CN as the owners of the tracks, GO transit, Town of Oakville)? Surely, safely is not a valid reason. It would have been easy to properly fence off the foot-path from the rail line. Recently, a new VIA station has been built in Oakville, right adjacent to the GO station. Can anyone tell me why these stations have not been combined under the same roof for the convenience of the customers? I know that VIA and GO are two separate legal entities, but with some efforts it should have been possible to collaborate. Which GTA Public Transit System Do You Guys Like? Who Like The Most or Who Hate The Most?